Elijah Woods born in Cedar Rapids, Iowa, USA. He moved with his family to Los Angeles in 1988. Elijah Jordan Wood, although referred to as Elijah Wood, started his school life showing some ordinary skills and abilities. Whilst acting and singing in school and local productions he demonstrated that he had a an aptitude for entertaining audiences. This then lead on to his mother bringing him to an Annual International Modelling and Talent Association Convention, at the age of seven. While there, he not only wowed agents from around the globe, but also quickly scored himself an acting deal. Originally a child model from Cedar Rapids, Elijah Wood quickly became an award-winning child actor, working with the likes of Robert Zemeckis, Barry Levinson, Richard Donner, Rob Reiner and Ang Lee. He gained a number of small film parts, including Back to the Future II (1989), before playing a starring role in Paradise (1991). 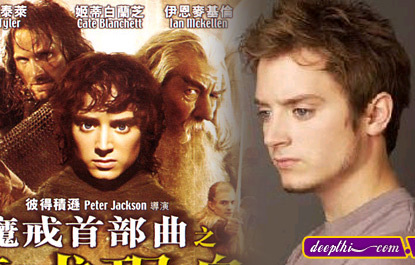 After several further films, he became well known following his role as Frodo Baggins in The Lord of the Rings trilogy (2001�3). Later films include Eternal Sunshine of the Spotless Mind (2004).